I looked at old New York Times stories about Allen. There’s one on December 13, 1951, announcing that he got the lead part. He must have been beside himself. Imagine having that kind of accomplishment at that age. Amahl aired live on NBC on Christmas Eve at 9:30PM. 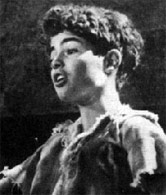 “The clarity and tone quality of his accomplished singing were secondary to his remarkable acting and facial expression,” the Times wrote the next day. Chet Allen killed himself on June 17, 1984. Gian-Carlo Menotti is still alive at 95, by the way. I read something he wrote for the Times in 1971 about growing old. It’s very dark, and he rails unreservedly, “On approaching old age two ghosts must be abjured: disillusionment and bitterness. For the dreamer I once was, disillusionment is almost unavoidable. For the fighter I still am, the bitter taste of defeat, especially when defeat is considered unjust or treacherous, is apt to poison one’s heart …” It made me like him. He’s just so honest. And he talks about the small joys. And “the dignity of being needed.” His one true joy in life seems to be the Spoleto Festival, which he founded, and continues today. I see in Wikipedia that it says the festival was founded in 1977, which can’t be right. He’s talking about it in 1971, and refers to their programs for the past 14 years, making it sound like it’s been around since 1957. Weirdly, on the Spoleto website they say 1977, too! Oh wait, no, they say it began in Italy in 1958. Okay, all is right with the world again.